Golden Retrievers are one of the most popular dog breeds, they are beautiful, smart, loyal, gentle, often goofy and comical, and oh so loving. Ask any owner of a Golden Retriever what they love about their dog and they will give you a list of things, but ask them what they don’t like about them and they will tell you the amount of shedding they do. Yes Golden Retrievers shed, and there is nothing that you can do to completely stop them from shedding, but there are some important tips in this article that will help you get control of all that shedding. Why Do Golden Retrievers Shed? Golden Retrievers are known for their long furry coat, in fact it is a double coat. A double coat consists of a top coat which is a protective layer of long guard hairs, and the undercoat which is soft and fluffy. The top coat helps keep dirt and debris out, and is water repellent, and protects your dog from harmful UV rays. The undercoat works to keep your dog warm in the winter, and cool in the summer. The undercoat is what sheds heavily twice a year, during Spring and Fall, it is often referred to as “blowing the coat”. During Spring your golden is getting rid of their thick winter coat, to make room for their lighter summer coat. In the Fall, their lighter summer coat sheds and makes room for a thicker winter coat. Throughout the rest of the year goldens shed moderately. Meaning you will find dog hair everywhere, on your floors, couch, and clothes. Shedding is completely normal, and natural, dogs lose old or damaged hair through shedding, and it happens daily. It is the same for us humans too, we lose hair daily as well. When you get a Golden Retriever puppy, their very first shed will be the heaviest. This is because they shed their entire puppy coat around 6 months of age, to make room for their adult coat. I still remember my Ellie’s first shed, it was excessive! I just remember there was a lot of hair everywhere, and it hasn’t been that bad since. While heavy shedding is completely normal for Golden Retrievers twice a year, there are other factors that can cause an increase in your dogs shedding. The old saying “you are what you eat”, rings true in so many ways, and it is the same for your furry friend. 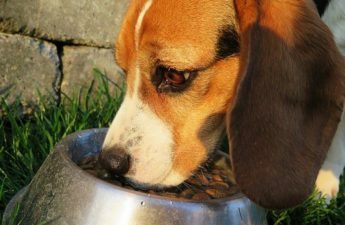 If you are feeding your dog a poor diet, one that is not nutritious or balanced, it will show in his/her skin and fur. Your dog will have dry and itchy skin, damaged hair, and increased stress. If your dog has allergies, his/her skin will be irritated and itchy. Your dog will itch and all that itching will loosen the hair follicles, and the hair will fall out quick and easy, increasing the shedding. Allergies can be environmental (grass, pollen), they can be caused by certain foods (chicken, beef, eggs, etc. ), or by shampoo, cleaning products, laundry detergents, and even plastic. Your dog can shed more when he/she is stressed. Causes of stress in your dog could be from moving, death in the family, new baby or puppy in the family, or being home alone for long periods of time. When a dog is stressed or anxious, they lose more hair. The same way humans lose more hair when they are stressed. If your dog has fleas, ticks or other parasites on him, your dog will be irritated and scratch more. All the scratching damages your dogs skin and will loosen the hair and cause more shedding. There are certain medications such as corticosteroids, that can cause your dog to shed more than normal. Shedding that occurs due to taking medication is often reversible once the medication is stopped. Thyroid hormones help to stimulate hair follicles promoting hair growth. If your dog suffers from hypothyroidism (low thyroid levels) then the hair will become thin and brittle and fall out. Imbalances of hormones like testosterone, estrogen and progesterone can also cause excessive shedding. If your dog has recently been spayed or neutered, then there will be an increase in shedding. Excessive shedding can occur for several months after your dog has been fixed, and happens more in neutered males, due to the changes in testosterone levels and other hormones responsible for keeping the hair follicles strong and shiny. Pregnancy and lactation can deplete your dog of calcium and minerals that are needed for a healthy coat, leading to excessive shedding. It is completely normal for a female dog to shed more hair during this time. Make sure to give your dog a healthy nutritious diet. Feeding your dog a proper diet will result in a healthier dog and a healthier coat. A healthy diet that includes essential vitamins and nutrients, fatty acids, and digestible protein, will help reduce shedding. Avoid feeding anything that your dog may be allergic too, and avoid low quality food that is filled with filler and ingredients that you cannot pronounce. A diet high in protein, and Omega-3’s, will help to improve your dogs overall health, and will strengthen your dogs hair and keep the coat beautiful. Always have fresh clean water available for your dog to drink. Keeping your dog hydrated will help to prevent excessive shedding. Dehydration can cause dry skin in your dog, which can cause itching and irritation, resulting in loosening of the hair, causing your dog to shed more. Brush your dog regularly, I highly recommend daily brushing of your Golden Retriever. All you need is 10-15 minutes a day to give your golden a good brushing. This will help stimulate blood flow to the hair follicles, and promote a healthy coat. Brushing outside is also recommended, to avoid excess hair in the house. A good quality Pin Brush is all I use every day on my Golden Retriever, if you want to read about the brushes that I recommend for a Golden Retriever, you can read my article by clicking here. Bathing your golden will help to loosen and remove the dead hair, and prevent extra shedding. Only use shampoos that are meant for dogs, human shampoos can disturb the pH balance of your dogs skin. Try to bathe your golden once a month, bathing your dog too often can cause dry skin. Use a good oatmeal shampoo to help soothe and moisturize your dogs skin. Have your golden groomed by a professional. A good grooming will go a long way in preventing excessive shedding. Research groomers in your area, to make sure they are familiar with grooming a Golden Retriever. The coat of a golden should be properly trimmed to look neat, it should NEVER be shaved! I cannot stress the fact enough that you should never shave a golden, find out the reasons why you shouldn’t shave a golden in my article here. Only use natural cleaning products and unscented laundry detergents around your house. Certain chemicals and scented products can cause an allergic reaction in your dog, causing itching and irritation which can lead to excessive shedding. Keep your dogs bedding clean by using natural and unscented laundry detergents. By keeping a calm environment for your dog you will reduce any shedding that can be related to stress. Stress is a major factor in excessive shedding. Recent life changes like moving, or changes to the family dynamics can cause stress to your dog. Maintain a comfortable and relaxed setting, and avoid anything that can make your dog anxious or stressed. Keep your dog on a regular routine by doing things at the same time each day, such as walking, feeding, bathroom breaks, and bedtime. If you work all day and your dog is home alone, consider hiring a dog walker, or taking your dog to a doggie daycare, or provide your dog with plenty of chew toys, or puzzle toys to keep him busy and mentally stimulated throughout the day. Spend quality time with your dog, playtime and going for walks are great ways to reduce stress not only for your dog but for yourself as well. Keep your dog on a regular flea and tick medication, (consult with your vet), and investigate any scratching that your dog is doing, as it might be a result of fleas or other parasites. Giving your dog regular daily exercise will help improve circulation and blood flow to the skin. Oxygen and nutrients that are circulated will help promote strong and healthy hair, reducing shedding. When you own a Golden Retriever you will need a good vacuum. Do a good vacuuming of your home once a week, and touch up any spots where you see hair every couple of days. You will want to have a few lint rollers on hand as well, stash one in your purse, and in your car. Owning a Golden Retriever is one of life’s greatest joys, and their shedding should not discourage you from getting this breed, that is unless of course you have allergies. By feeding your golden a proper diet, brushing and bathing regularly, controlling allergies, and eliminating stress in your dogs life, you can get control over the amount of shedding. When you own a Golden Retriever, you will be showered with love and affection, and soon you will realize that the shedding is really not that bad, and you get used to it. By following the tips mentioned above, your golden will be happier, and your home will have fewer clumps of hair. How do you minimize your Golden Retriever’s shedding? Please leave me a comment below, I would love to hear from you. Your tips are all really helpful, particularly the ones on how to deal with shedding, which is obviously a problem to all owners of furry dogs. And your explanation of why dogs shed their fur is really interesting. I had thought that it was mainly a seasonal thing, ie. that they shed their coats in warmer weather and grow them more thickly in cold weather. Is that the case too? I like your emphasis on giving your dog a good natural diet – of course that is important to all creatures! You obviously really love your dog, and I know that your tips will be invaluable to all dog owners and not just for those who own Goldens. Thank you for your comment Chrissie. Seasonal shedding is of course the number one reason for an increase in shedding. I am glad you enjoyed my post. We’ve owned a Basenji dog, and we didn’t have to worry so much about her fur. It sure takes a lot of work to take care of a Golden Retriever. Since our dog Beauty was killed by an angry neighbor who didn’t like dogs, we’ve been very hesitant to get another one. We no longer live in the same neighborhood, though. We’re still unsure of the dog breed to get for our kids, and after reading your post, I think it’s going to be hard to take care of a Golden Retriever. If I may ask, has it been easy to take care of Ellie? Will it be a lot of trouble for a full-time working mom to take care of a Golden Retriever? Hi Princila, that is awful to hear about your dog being killed by your neighbour, I am sorry to hear that. If you are considering a Golden Retriever for your family, you need to read my article on Living With A Golden Retriever. Golden Retrievers are wonderful with children, they are very easygoing, and gentle and loving. They do require constant human attention and affection, so leaving them at home for long periods of time is not good for this breed. They require a good amount of exercise and play time daily, and of course brushing and regular grooming. As an owner to this breed you need a lot of patience, and persistence. I loved your article on the shedding-machine that is the Golden Retriever. it’s so true…that as a water dog they have two coats that seemingly never stop shedding. You give some great advice on how important it is for them (and all dogs) to have a well-balanced diet to maintain a healthy coat. People always seem to forget about caring for their undercoat. Have you found a particular brush that helps with the thick undercoat? When I had a “golden” I had a long tooth dog rake that seemed to work well. they really do need to be brushed every day if you can. Hi Tim, thank you for your comment. A well-balanced diet is so important to maintain a healthy coat. The only brush that I use and love is a good quality Pin Brush, I brush Ellie every day with it. I do not use anything else, as I find this type of brush works the best. Hi Jenny, nice to meet you and your beautiful dog Ellie 🙂 I too have owned Golden Retrievers, and they do appear to shed a lot as house dogs. We used to joke that it was a great thing that our rugs and floors were in tones of brown and gold, they hid all the hair from our Golden girl (house dog). I presently own 2 Golden Retriever Xs, and their shedding is minimal because they spend 1/2 of their time outside. The artificial temperatures indoors, encourage out of season shedding. Our boys get a thorough professional grooming at the end of August or mid September to brush out and blow out their coats. After that they are non shedding until the following summer. If they were house dogs 24/7, I am sure I would have to get them groomed professionally every 3 months with home brushing too. A tip- add some Flax and or Fish oils to the diet, that are high in Omega 3s and you can minimize a lot of the out of season shedding. Hi Madeleine, I agree that temperatures affect the amount of shedding as well, and thank you for your tip of adding Flax and or Fish oils to the diet, to minimize the shedding. My first dog was a toy poodle as a child. I had this notion that dogs never shed. Later on when I got a Golden Retriever I was so shocked! I couldn’t believe the amount of hair that was like…..everywhere! I had an industrial strength vacuum cleaner that I used all the time. You are right though, it really comes down to what you feed your dog that causes your dog to shed or not to shed. Certain foods can cause reactions inside your dogs system and cause them to shed more. I know its more expensive, but having a higher quality diet and dog food not only prevents shedding but it also helps your dogs tummy and digestive system so they poop better and over all it elongates your dogs life! Consider that next time you are out shopping for pet food and are trying to “save money” getting generic brand stuff. Also brushing is really important but sometimes even if your dog is not healthy inside, no amount of brushing can help, your dog needs to have water all the time and healthy food. Treat your dog like its your child, not a possession. Hi Sophia, thank you for commenting. You are so right in saying that feeding your dog a high quality diet makes all the difference. A healthy inside equals a healthy outside, it is the same for humans. Hey Jenny, great post. I’m not much of a dog person but I can tell you that is one good looking animal and it shows you take care of her well. Personally, your approach to keeping your dog healthy even during pregnancy is brilliant. I think that if I ever should get a dog or my wife gets one then I think your post will come in handy because your post is very helpful and informative. Good job! Thank you so much R.J. I truly believe that a Golden Retriever will make a dog person out of anyone, they are the best. I am glad you found my post helpful and informative, thanks for commenting. The tips you give are very helpful. We did indeed brush Jax almost every day and it really helped in keeping the shedding in control. Hi Laura, sorry for the loss of your loving golden Jax. The heavy shedding that occurs during Spring and Fall, can make any dog owner go crazy and vacuum constantly. I am glad you found my tips useful, they really do help you get control of all the shedding. When I was younger we had a golden retriever. She was a lot of fun and got into everything. There are times where we would go out only to return home to find the house had been turned upside down. That’s when we made the decision that we needed to burn her out before we left her alone at home. And you’re right she shed so much that we were constantly picking up after her. Her hair would be everywhere. My dad started her on a diet of mixing a little bit of dry food with some wet food, we found that that helped quite a bit with her shedding. In order for her to get her exercise once we became smarter about how to not have our furniture torn apart was to let her out and run around our farm a few times. Hi Jag, thanks for sharing your experience with your Golden Retriever. They really are high energy dogs when they are younger, and need to burn off that energy. A dog that is left alone at home can become anxious or stressed , and that can cause increased shedding. This is a great article! One year ago I had a Golden Retriever and these dogs are very beautiful and smart. I was having a problem with my dog shedding but honestly, I did not know that it can be provoked by so many symptoms, I was thinking that is normal to happen some time. Hi Daniel, yes there are many reasons that can cause an increase in Golden Retriever shedding. It is very normal during Spring and Fall, and can be brought on by medical reasons that I have listed above. Thank you for commenting. Great post and it comes in the perfect moment! We have Sammy, he is a Golden Retriever, and yeah, he sheds a lot, sometimes 10 times a day! Never knew why it happens, and how to stop it. So that is why I’m so happy to stumble across your post. I will try the products you recommend, and hopefully they work! Hi Emmanuel, I am so glad to help you “shed” some light as to why your golden sheds so much. Thank you for your comment.